Do you like simple coleslaw? I detest the shop bought, greasy with mayonnaise, too much salt, identikit coleslaw. You know the one where all the pieces are smaller than a corn kernel and it has more in common with cottage cheese in terms of appearance & texture. Well this is healthy, crunchy & raw simple coleslaw. You use the best of fresh ingredients and skimp on the mayonnaise. I got this recipe from my mother who has been making a variation on this recipe for years. Whenever there’s a family BBQ it’s a given that she will bring this coleslaw along and there is rarely any leftover to take home for sandwiches the next day! The key to preparing this simple coleslaw is that you make individual components up to 3 days beforehand providing you keep them in sealed containers in the fridge. You can then add them at the last minute and mix. So if you’re planning a BBQ on Sunday, get this out of the way on Friday evening and then leave the ingredients to one side. If you intend to make enough for a large party just stick to the ratio of 1:4 of carrot:cabbage and always mix just before serving as the carrot tends to bleed into the mixture. If you like to add herbs or a slight onion flavour then chop some chives and parsley into the mixture. Peel and grate the carrot. If preparing for mixing at a later stage place the grated carrot into a plastic, sealable freezer bag, seal and put into the bottom crisper drawer of your fridge. Using a good sharp knife remove the core from the cabbage, peel off the outer, softer leaves (probably about 3) and discard these into your compost bin. Finely cut the cabbage into thin lengths. Repeat the step above with the freezer bag if preparing for another day. To serve take the large bowl and measure all the dressing ingredients into the bottom of the bowl (mayonnaise, yoghurt, vinegar, black pepper) and stir until they create a thin dressing. Next add your cabbage and carrot and mix well until loosely coated with the dressing then serve. Oh yum to the grated apple Lisa. Another one I like is to add some sultanas, red cabbage & swop out the cider vinegar for lemon or orange juice! That’s no problem, just mix the dressing well before adding & only add at the last minute before serving. This is because the acid in the juice will begin to pickle the vegetables and they will become soggy. No I’ve not tasted the Waitrose one yet B. Do give this a go because it’s so simple. I’m all about saving time me! I love home made coleslaw. 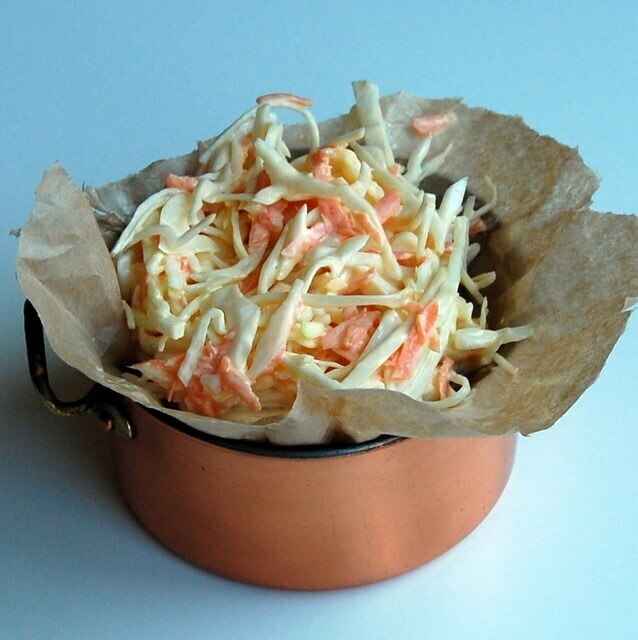 My current favourite is Nigella Lawson’s New Orleans Coleslaw (recipe on my blog). I will try this recipe as soon as the sun shines again, which I’m hoping will be very soon. Love your blog. That’s gas G I only just saw that episode from Nigella Express earlier today. I’m not convinced on the maple syrup in it but I’ll give it a go in the next while! Adding the curry spices sounds lovely. It’s a great recipe to start with and then adjust it to your family’s tastes. I’m glad you liked it! Any tips for what to do with the other 3/4 of the white cabbage? Can you freeze it, either before or after grating? If you find a full head of cabbage is too much for your needs you can normally buy a half or a quarter in the grocer’s. I often eat pieces of cabbage as a side, drizzled with fresh lemon juice and cracked black pepper. Grated cabbage kept in a sealed dry plastic container should keep for up to 3 days in the fridge (but I’d only keep it for 2 to be on the safe side). A whole head of white cabbage kept in the crisper drawer of the fridge will keep for longer than that. You could also saute grated cabbage with apple in butter and serve as a hot side. I hope that gives you some ideas! Oh thank you Yvonne. Thanks for stopping by & listening! I could eat slaw every day. I have not used yogurt but will try it. I like that you include a list of tools. Several years ago I began writing that list on my recipe cards and it makes cooking so much easier. Also, prepare your mise en place so no ingredient is left out. This is very true. Thanks Helene. Hi! I signed up for a pot luck at work and was asked to buy 2lbs coleslaw, so what do I do? I buy a 2lb bag of coleslaw (veggies only). smh. Well, I came across your recipe during my search for authentic Irish coleslaw and would really like to try this out! Can you please share how much mayo, yogurt, and cider vinegar I should use to mix with a 2 lb bag of mix? Thanks! Hi Kristin, goodness that’s a lot of coleslaw!!! Double the measurements of the mayo, yoghurt, and cider vinegar and see how you go. It should be a light dressing and not too oily. Add in extra by tablespoons of each if you find this isn’t enough. Hi Caitriona, thank you this is very helpful! You’re more than welcome Kristin. Good luck!